Winter squash are popping up everywhere and hopefully in your garden too. Gorgeous, and delicious, these are just a few of our favorite edibles along with their ideal cooking methods. Keep in mind these will keep for months in a dry dark cupboard. 1. Sugar Pie Pumpkin: The obvious choice for pies, but we love roasting it for Pumpkin Soup. 2. Carnival: Mild and savory, keep it simple by roasting in butter and brown sugar. 3. Spaghetti: An excellent healthy alternative to pasta the flesh separates into spaghetti like strands once cooked. 4. Red Kuri: Savory and buttery, popular for it's edible skin. 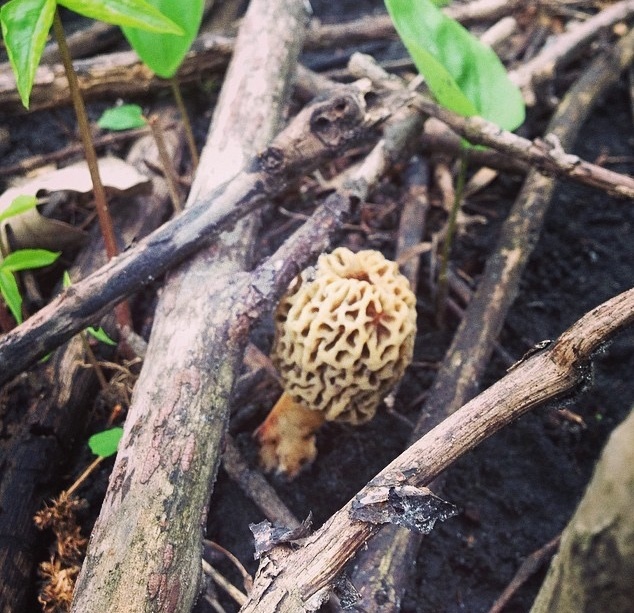 Great braised or in soups. 5. Buttercup: Dry, sweet and stringless. We love using this with curry, especially in soup form. 6. Delicata: Sweet potato like flavor, awesome sliced and roasted with olive oils, s+p. 7. Turban: Mild and nutty, use in recipes that call for sugar pumpkin. 8. Butternut: Sweet and mild, roast this cubed/peeled with a granny smith apple and onions for soup or eat alone. 9. Sweet Dumpling: Sweet and mild. Perfect for roasting whole or in cubes. Of the nearly 7,000 varieties of apples grown in the United States we match up eight common varieties with their ideal preparation and usage for you autumnal cooking adventures. And to get you through these adventures we've also included some equivalents when it comes to chopping and measuring. You now have no excuse to take full advantage of this year's incredible apple crop, get cookin! HOW MANY APPLES IS THAT? So Pickling + Fermentation, Same Thing–Right? Wrong, the quick and dirty of pickling vs fermentation is that pickling involves heat processing and fermentation does not. When you pickle, you usually heat vinegar, salt, and sugar (which is called "brine") in water and pour it over the vegetables. To make the pickles shelf-stable, you can them using a canner (a big pot that you put the jars in to get them to seal). When you ferment vegetables (there are so many other ferments and methods!) you generally use a salt water brine and submerge your chopped (or not) vegetables underneath the brine using a weight of some sort. The brine creates an environment that is conducive to the growth of "good bacteria" (lactobacillus plantarum in this case) and prevents molds and such from growing on the vegetables (which would happen if they were exposed to air). Fermentation also involves time– sometimes a lot, sometimes a little, depending on your desired result. Some sauerkrauts can ferment for months. 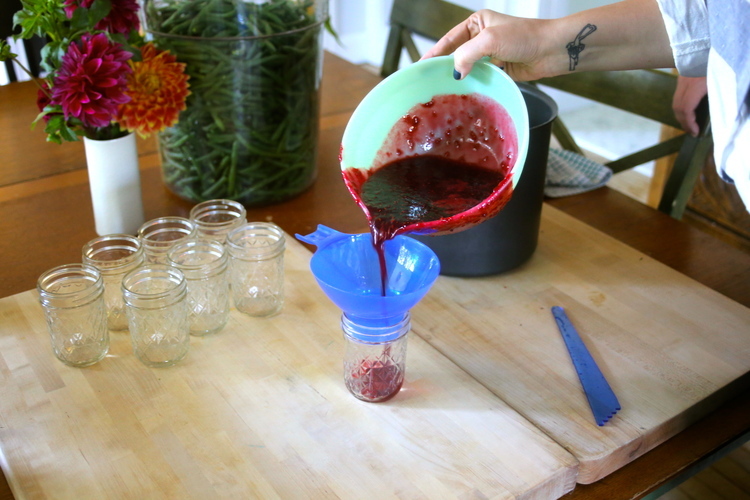 Ideally, you'd ferment for more than 5 days to hit a good flavor and probiotic level. You can check the pH to make sure if you don't trust your tastebuds, which should read lower than 4.0. Ferments are not usually canned after they are done fermenting because the heat would kill the good bacteria. Instead, they are stored in a cool environment to slow down the fermentation (in the case of refrigeration, it nearly stalls the process). Getting a recipe from my Grandmother Tootie was almost always nearly impossible. Most of the time it was a list of ingredients and a cook temp, lots of 'pinches' and 'season to taste'. To this day many of my cousins trade recipes with the thrill of discovering buried treasure. This is because she had well developed cooking and baking instincts from a long life spent in the kitchen cooking for a large family. Today we rely entirely too much on googling recipes before we could ever recall them. Unless of course you've made something a thousand times. Now a simple summer salad of greens and tomatoes is something we should all be eating every day, especially if you over planted those now nearly bolting greens and can't wait to sow a second row. This dressing is my contribution and my grandmother's contribution to developing your cooking instincts. Hopefully it won't take a thousand times to get it right, but we dare you to try and put those measuring cups away! Try it once using our measurement suggestions below and you will be eyeballing and pinching soon after. STEP ONE: Place all of the above ingredients in a jar and shake until frothy. Toss the dressing into crisp cool greens with large chunks of your ugliest sweetest tomatoes. *pro tip cut the damn tomatoes with a serrated knife, even a bread knife. We spent entirely too much time smashing tomatoes with butcher knives in our lifetime. do it. Dilly Beans awaiting their vinegar liquid mixture before being sealed and enjoyed. Beans, beans the magical fruit! The more you eat, the more you... eat! If you use this recipe that is. 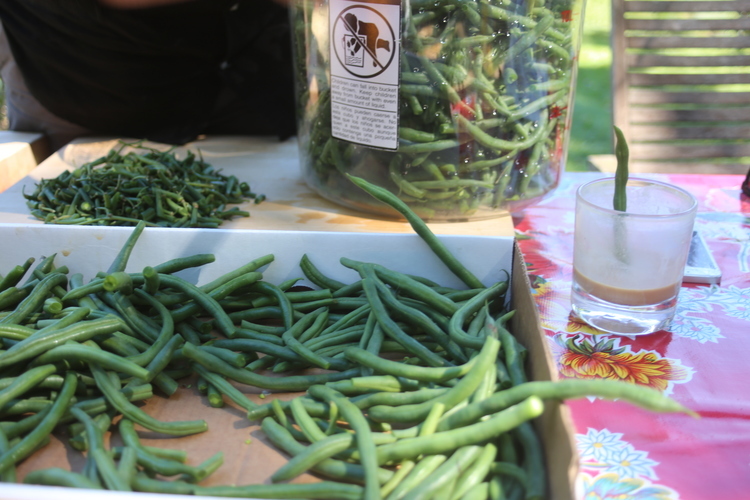 We stopped by our favorite weekend canning spot to learn the basics of canning Dilly Beans. Jar lifter or rubber tongs. 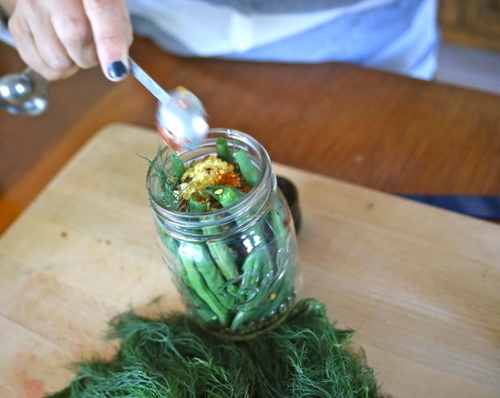 Pack beans lengthwise into hot jars (you can heat them on the oven rack). Add ¼ teaspoon cayenne and ground mustard to each jar. Add 1-2 cloves a garlic, a pinch of fresh dill and other spices to your taste preferences. Boil vinegar, salt and H20 together. Pour boiling vinegar water over beans in their jars. Remove air bubbles from jar. Transfer hot jars back to boiling water for a 10 min H20 bath to seal. Listen for the delightful popping sound as they seal themselves for your enjoyment later. 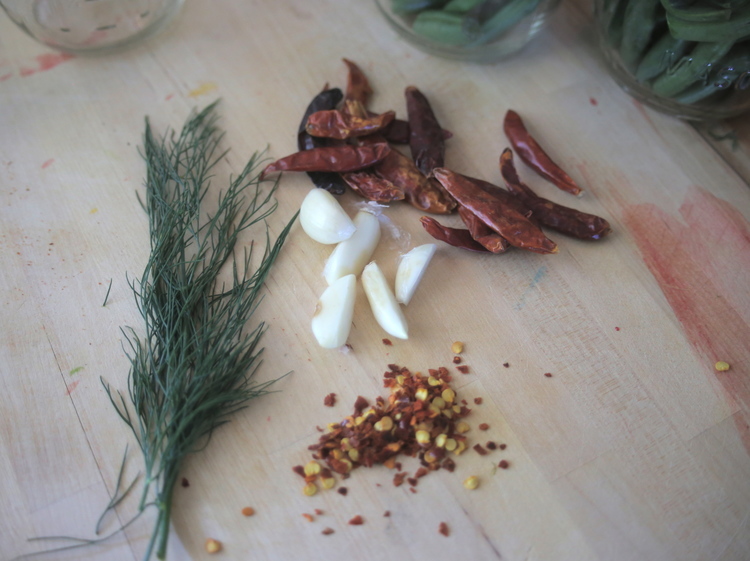 Ingredients for our seasoning; dill, peppers, garlic, red pepper flakes. Harper sitting in the sun kissed window making her jewelery for the day. Garlic awaiting a new purpose. 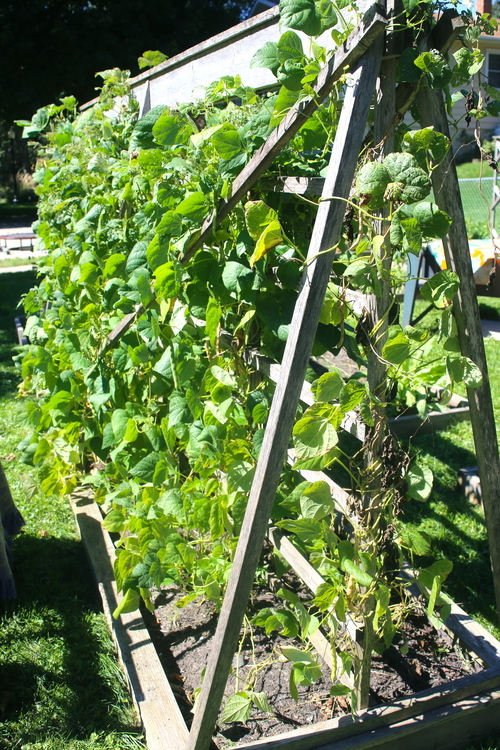 Beans thriving on a trellis in Lunna's garden. Using this handy garlic roller, we peeled the skins off our garlic cloves but left them whole for the canning process. 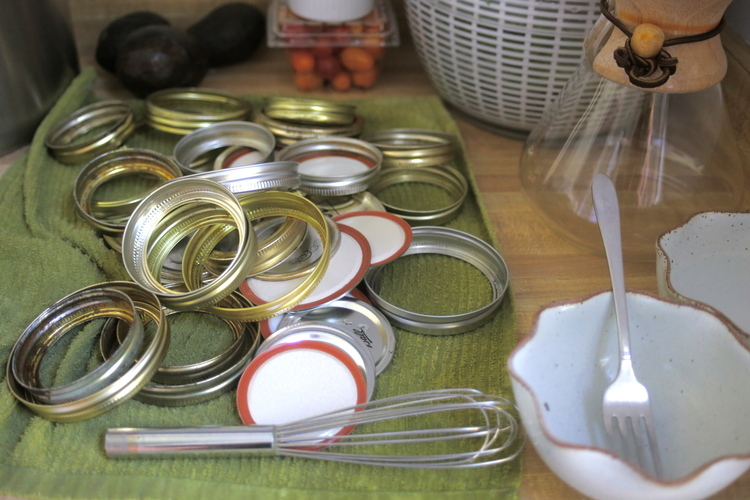 Heating and sterilizing your jars is an important step! You can keep them clean and out of the way by leaving to cool in the oven. Vinegar patiently waiting to be poured in the jars. What a good recipes look like, stained, worn and loved. 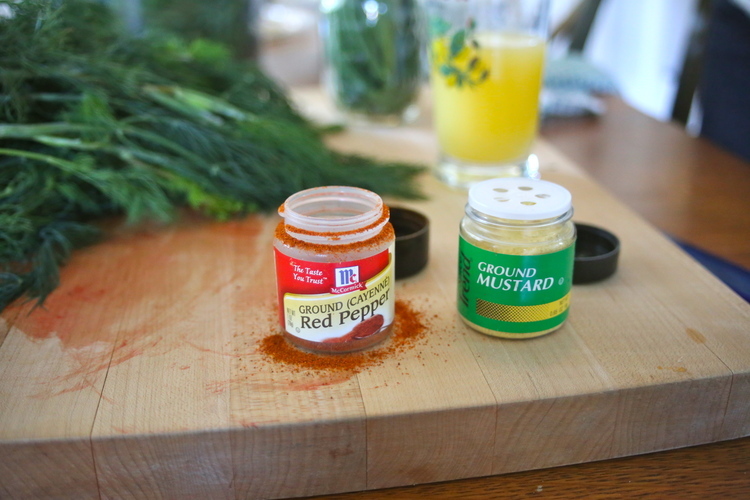 We used a dash of Ground Mustard and Cayenne Pepper to top off the ingredients in our jars. First step, cram beans into jar. Third step, dump desired amount of extra seasoning on top. 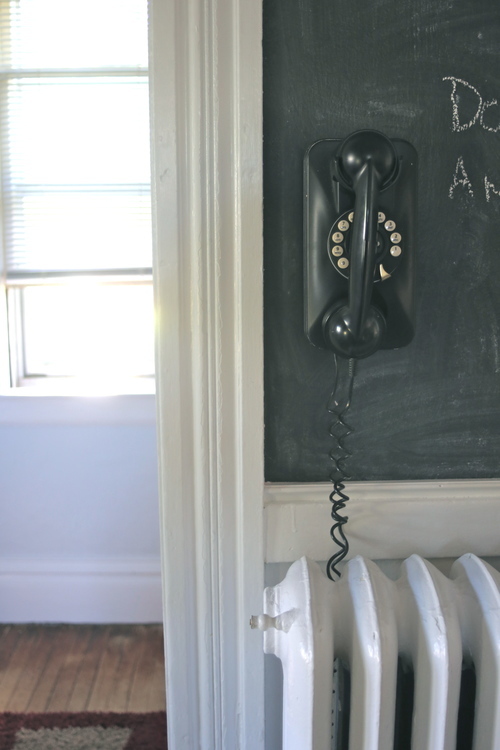 We started by admiring the home decor (per usual). As a kid, I used to pick honey-suckle with my neighbor Charlie. We'd giggle as the tiny pockets of sweet nectar popped open as we ate them. Fast forward 25 years and I decided it was time to broaden my horizons with an another popular edible, nasturtiums. I tried 4 varieties this year; Apricot Twist, Empress of India, Jewel of Africa mix and Alaska mix. Theses flowers and their leaves are peppery, a bit like a radish, so you don't want to use too many or they might take over the flavor of your dish. Nasturtiums can also be used as a medicine and are packed with Vitamin C. I read somewhere though, that they may not be totally safe for little kids to eat, so if you've got little ones, maybe shy away from giving them a bowl of flowers to munch on. 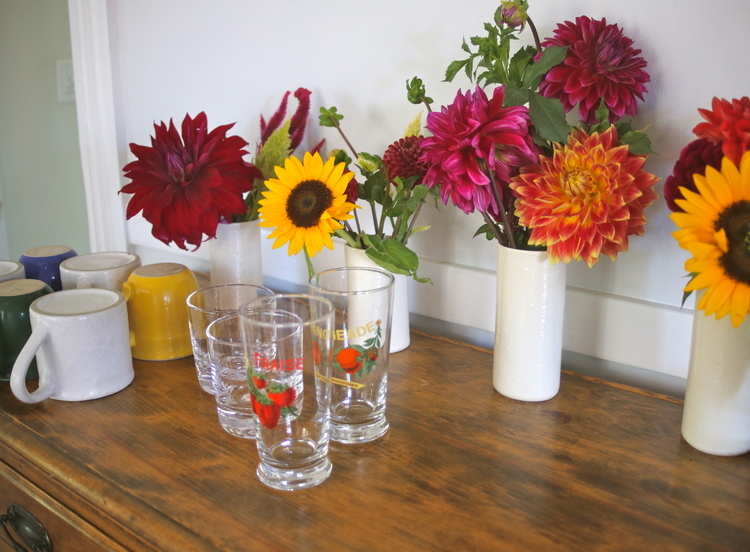 I didn't really have a plan for what I wanted to make, but I gathered my flowers, veggies, sour-dough, a baguette and a few types of spreads and started experimenting. top bread with the mixture, a few nasturtium and enjoy! pick the petite nasturtium leaves, they have a milder flavor and are super cute! if you want to get fancy, try using the giant nasturtium leaves as plate decor, I ended up using one to hold dips and that was a hit! Send us your favorite edible flower recipes and be sure to Check out our full round up of edible flowers to eat and plant in this year's garden! These yummy babes can be filled with just about any of your favorite fruit pie filling. Take advantage of the season and try out this hand pie recipe that includes a strawberry rhubarb filling. Perfect for the silverwear-less afternoon picnic or your Mother's Day brunch. Mix strawberries, rhubarb, 1/2 cup sugar, cinnamon, cornstarch and orange peel together and set aside. Beat together the egg yolk and whipping cream in a small bowl and set aside. Roll out chilled pie crust onto a floured surface. Cut out your pie crusts and place them onto the cookie sheet, make sure to dip your cutters into flour to avoid sticking. Listen carefully, only drop about a full teaspoon of the strawberry+rhubarb mix onto the center of each pie crust. If you drop too much the hand pies will leak and burn in the oven. You want plenty of crimping room around the mix. Dab your finger with water and swipe one side of the pie crusts then gently fold the filled pies closed. Take a fork and crimp the edges. Gently brush each pie with the egg mixture and sprinkle with sugar. Place in the oven for 20 minutes, but keep an eye on them. You can take a knee and let these chill in the freezer for about ten minutes, but who has a freezer large enough for a cookie sheet? not us. Let the hand pies cool before serving with a side of vanilla bean ice cream. *If you don't have time for pie crust, pre-made rolls can be purchased out of the dairy section at your grocery story. ...But hey, try it sometime it really takes about 15 min plus a little extra planning and is sooo much tastier. Follow the instructions carefully and make a few test crusts. Right now our country's best orange crop is being picked and shipped out to your local market with the sweetest tasting juice beneath it's peal. While you can't run out of ways to use the peaking citrus our favorite and easiest two step method is below. Packed with vitamin C & A, a tall glass of fresh squeezed orange juice will put a smile on your mid-winter scowl and temporarily cure any cold. We mean it. The oranges traveled long enough to get here, don't they deserve a nice squeeze?! You want to begin with soft room temperature oranges. Warm them in your hands and press them into your counter. Slice each orange in half and press and grind the oranges into your juicer. How would you describe the taste of an herb and what it brings to a dish? Knowing the true flavor profile of an herb is critical in developing good cooking instincts, weaning yourself from compulsive recipe glancing, and will allow you to make the most out of your herb garden. The following includes some flavor clues and suggestions adapted from Tootie's most trusted county cook book for everyday cooking herbs. As a general rule of thumb most herbs will lose their flavor once they meet heat and will cook down, so consider incorporating your herbs at the last possible moment. FLAVOR: Strong and piney with a tea-like aroma. What does piney taste like? Think mint and pepper. USES: Goes very well with garlic and butter. Rosemary is an important seasoning in stuffing for duck, pork or turkey. We add a full sprig or two to roasted red potatoes. FLAVOR: Woodsy and mint flavor but much softer than Rosemary. USES: Salt+Pepper and a big pinch of chopped thyme goes well in roasted carrots and honey. This herb is great used as a rub over poultry and fish. FLAVOR: Fresh grassy flavor with a hint of citrus. USES: We cover most fresh summer vegetables in lime, salt, cumin and cilantro. Heaps of cilantro will also go into your favorite guacamole or salsa. With that said, cilantro is a staple in many ethnic dishes from Mexican to Indian to Asian. Warning: Ask before dousing your next dinner party in cilantro. Most people either love or hate this herb. According to internet legend there are some genetic variants linked to the perception of this herb having a soapy taste. We say quit your whining and embrace the fresh, citrus amazingness of cilantro! FLAVOR: Cinnamon or licorice flavor with a peppery sweet hint. There are different types of basil plants that produce strong nuances in flavor from sweet basil to spicy basil. USES: If your recipe calls for tomatoes or tomato sauce, add a touch of basil to bring out the rich tomato flavor. Basil has a huge range in flavor so it works in a variety of ethnic dishes from Thai to Italian. FLAVOR: Savory and fresh flavor, soft pepper and mint but very mild. USES: Parsley, sage, rosemary are thyme are no joke, they go well together in just about anything. BUT, we urge you to mash them into some soft salted butter alongside some warm crusty bread. Traditionally a key ingredient in meatballs of any kind. FLAVOR: Warm and savory with a earthy mint flavor. USES: Stuffing would not be the same with out a handful of dried sage. We associate sage with autumn flavors and cooking. Goes well with just about any squash dish or in a rub for pork. In Tootie's day she made lefse with something called 'Instant buds'. Thanks to my Mother's likely resentment towards said buds, I really didn't grow up with an intimate knowledge of instant potatoes. But when you are making Lefse for a crowd after all of the potatoes have been claimed, you might turn to Potatoes in an Instant to make life just a littler easier on the farm. The following is a recipe for Lefse using whole Russet potatoes, and in honor of Tootie we have also included below her favorite never fail recipe from the Appleton Senior Citizen Center. Note: You will certainly need a lefse griddle and turning stick. The remaining supplies can be fudged a bit with with more common kitchen supplies. Cover potatoes with water and cook until tender. Run hot potatoes through a potato ricer or use a cheese grater to essential shred the potatoes. Place into a large bowl. Beat butter, cream, salt, and sugar into the hot riced potatoes. This is very important, let cool to room temperature (this will take hours). Now is the really hard part, do you roll up your lefse with just plain butter or are you a butter and sugar kind of square head? Either way this recipe will make around 60 lefse cakes and is easily stored in the freezer for months. I have been told to let the lefse first cool in a plastic garbage bag so that the cakes absorb as much moisture as possible before freezing. Good luck! Make Instant potato buds like you would for eating except double the amount of butter used on the directions on back of the box. Also use cream instead of milk. Cool it well. Use half a cup of flour to each one cup of mashed potatoes and mix these to well together. Roll out as thin as possible on a lightly floured cloth board. Two cups potatoes and flour makes ten. Whether you are under the weather or nesting quietly for a big week ahead we have two recipes to cleanse the conscience and soothe the belly. aka One hangover two solutions. In order to achieve the rich and creamy texture of a bisque make sure you have an emulsion blender or food processor handy. We prefer the emulsion blender because it's cheap,handheld, and requires minimal cleanup. 1. Remove greens and wrap beets individually in tin foil. Roast beets in the oven at 375°F for one hour. Cooked beets will easily be pieced with a knife. 2. Cool and rinse with cold water while peeling the beets. Cube the beets and set aside. 3. Let's talk about the Leeks. These guys really hold onto their dirt so rinse and rinse again going as far as pulling the layers apart slightly. Then chop the white and pale green parts of the Leek only. 4. Melt butter and oil into a larger heavy bottomed pot at about medium heat. 5. Add Leek, Onion and Celery. You want them to sweat out a little and turn clear. Stir often enough so that they don't start to stick to the bottom of your pan. 6. Stir in all of your spices and beet cubes and cook for about eight minutes. 7. Add 2 cups water and your Bay leaf/herbs to the pot. Bring to boil. 8. Once at a boil, reduce heat and cover for about 25 minutes until your vegetables are all soft. 9. 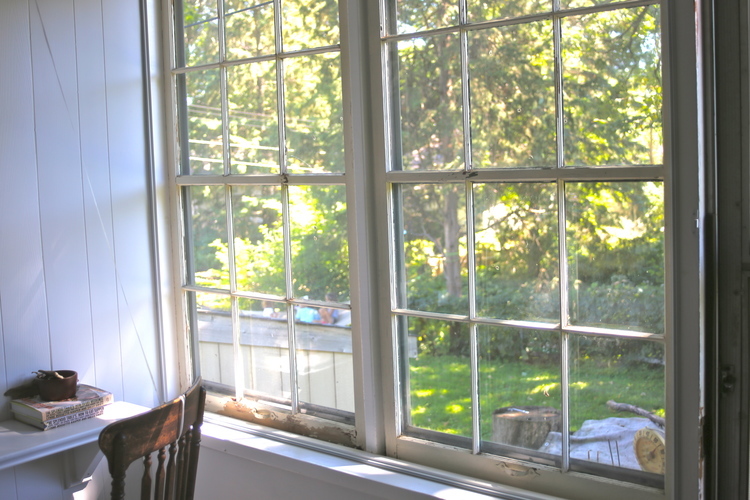 Remove Bay leaf and herbs and turn off the heat. Add cream and S+P to taste. Kaes Spaeztle is a handmade rich doughy noodle that we combined with caramelized onions, swiss cheese and topped off with some fresh parsley. Sure to stick to the ribs and comfort the belly. 1) Sift together flour, nutmeg, salt and pepper. 2) Beat eggs in a medium bowl. Alternately mix in milk and the flour mixture until smooth. Let stand for 30 minutes. 3) Bring a large pot of lightly salted water to a boil. 4) Press and shake batter through a larger blade cheese grater or colander into the boiling water. 5) When the spaetzle has floated to the top of the water, remove it to a bowl with a slotted spoon. 6) Mix grated cheese in with the spaetzle. 7) Melt butter in a large skillet over medium heat. Add onion, and cook until golden, about 15 minutes. 8) Add caramelized onions to spaetzle and cheese. 9) Serve immediately with a little fresh parsley.